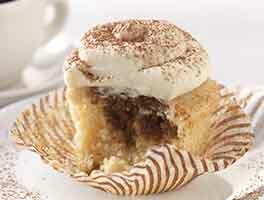 "YUM" seems to be the unanimous response from our taste-testers when we serve these cupcakes. A spicy, gingery cake finds its perfect complement in sweet, rich cream cheese frosting. 1 hrs 10 mins. to 1 hrs 22 mins. Preheat the oven to 350°F. Lightly grease 24 small paper brioche cups, and place them on the baking sheet. 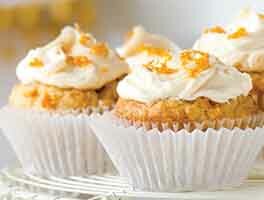 To make the cupcakes: Combine the flour, baking soda, cinnamon, ginger, cloves, nutmeg, and salt. Set aside. Whisk together the melted butter, brown sugar, molasses, and egg. Add 1/4 cup of the water to the melted butter mixture, then half the dry mixture, and stir. Add the remaining water and dry mixture, stirring until thoroughly combined. Spoon the batter into the prepared brioche cups. Bake the cupcakes for 20 to 22 minutes, until a toothpick inserted in the center of one comes out clean. Remove the cupcakes from the oven, and transfer them to a rack to cool for 30 minutes. To make the frosting: Beat together the butter and cream cheese until light and fluffy. Add the sugar and cinnamon, beating well. Add the milk a little at a time, until the frosting is spreadable. Fill a piping bag with the frosting, and pipe large swirls on top of the cooled cupcakes. Or simply frost by hand. 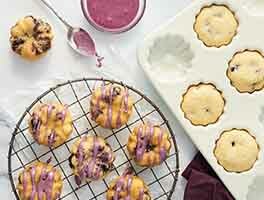 To make standard-sized cupcakes, line a 12-cup muffin tin with paper cups, and lightly grease the cups. Divide the batter evenly among the cups, and bake for 22 to 24 minutes, until a toothpick inserted in the center of one cupcake comes out clean. Excellent gingerbread cupcake! I made a gingerbread cake that was low on gingerbread flavor, so this looked promising. It did not disappoint. It smells and tastes like a gingerbread cookie and is incredibly moist. I doubled the recipe and made standard size cupcakes, and it yielded 28 cupcakes, which I baked for 22 minutes. I was only able to frost 24 because my 5, 8, and 10 year olds (and hubby) ate 4 before frosted. My kids said they wished their mouths were bigger to eat more. Kid (and hubby) tested and approved! While I noticed a few parts of this recipe that didn't make any sense, I decided to follow it to a T anyway... and when finished, I ended up with volcano like cupcakes that were completely sunken in the middle. Please note that I made 12 regular sized cupcakes, and when filling my liners, I used a batter scoop to ensure that they were all even. The first problem is that this recipe calls for melted butter instead of softened. Creaming softened butter causes little bubbles to appear in the butter which, when baked, turn into slightly larger bubbles... which creates a light and fluffy texture. By melting the butter, you end up with a much heavier, stickier texture (which works great for certain types of cookies, but not so much with cakes). The second problem is that this recipe calls for no baking powder. 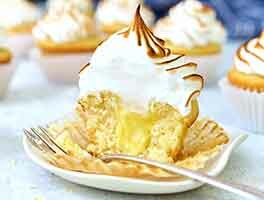 Baking powder is used in many cupcake recipes for its leavening power, and without it, your cupcakes may end up looking like a hard stump with no rounded top to frost. I also thought that these cupcakes had a very heavy molasses flavor which covers up some of the other amazing flavors (ginger, nutmeg, etc.). 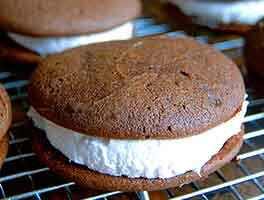 If you bake this recipe, I recommend the following tips: (1) Leave the butter out at room temperature until softened and then cream it with the sugar before adding the molasses and egg. (2) Add 1/2 teaspoon of baking powder when combing your dry ingredients. (3) Cut the amount of molasses down to 1/4 cup. I've tried this recipe twice, first as mini cupcakes and then as standard size. As minis, the baking time was way off and they came out hard and dry. As standard size, there's enough batter for 14 cupcakes so be careful not to overfill. Baking time still seems long. The frosting only needs one tsp cinnamon so its not overpowering. Will not be trying this recipe a third time. Usually KAF recipes are flawless so disappointed in this one. This is a good recipe. Will use this recipe again. Did not make the frosting, just the cupcakes. Very happy with the result. I needed to double it, and that went off flawlessly, even though I was in a big hurry. Doubled, the recipe made up to exactly 20 cupcakes. And since I was in a hurry, I just put the "butter" (see below for my confession) into the stand mixer and put in the sugars and just let it go while I measured out the flour and other dry ingredients. Also, due to dietary issues involving some of the folks who were going to be eating these cupcakes, I had to substitute spelt flour for regular flour. Did not seem to impair the making, the baking, the flavor, or the eating of these. Also, I could not use butter, so, as intimated above, well, I used, ahem, Crisco. (::lowers head in shame::) Also, I used an enormous quantity of cinnamon, way way more than the recipe calls for, mostly because I was in such a hurry and I had to just dump it in. When I tasted the raw dough, I though, OMG, I used way too much cinnamon. But once they were baked, they were fine. Also, I threw in a bunch of little pieces of sugared crystallized ginger that I had, little pieces specially made for baking. Some cupcakes had ginger bits in them, some didn't. Everyone at the party thought these cupcakes were great. Delicious and moist! I topped each cupcake with a small KAF gingerbread cookies. I made these cupcakes tonight for a Christmas Open House at my in-laws' place. The cupcake recipe was pretty simple and they came out tasting great, with good texture. I made 12 standard size cupcakes and baked at 350 for 22 minutes. Once they cooled they actually looked too dry and felt a little hard on top, but I was pleasantly surprised to find that was just a nice crisp top, almost like a loaf crust, which gave way to a pretty soft and moist body. I used a cinnamon brown sugar buttercream frosting from another site, as I'm not a fan of cream cheese. Amazing recipe! These cupcakes baked well and had an amazing, deep, spicy gingerbread flavor! And then the frosting was just the right amount of sweet to balance out the cake. I'll definitely be making these again!